France is not only the paradise of pastries, cheese and wine, it is also the new Eldorado for fans of new technologies. 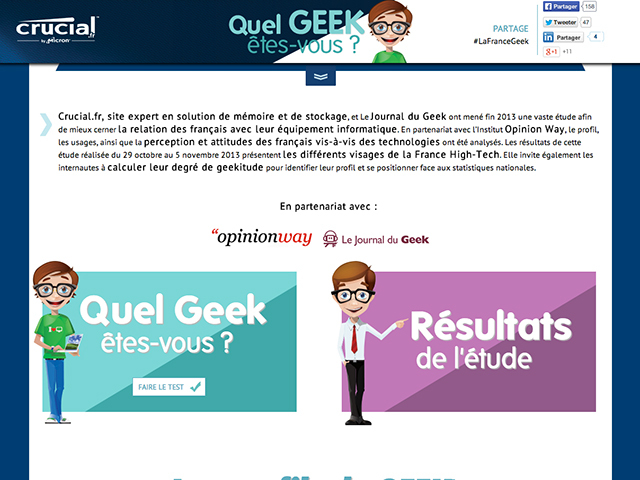 In any case, what is the result of a study conducted by Crucial in partnership with OpinionWay and Le Journal du Geek. 77% of French actually be of interest to all these electronic products are now part of our daily lives. The best is yet to come as the specialist high-speed storage is not stayed there and has the opportunity to run a computer “geekiness” to help users discover their technological profile. From the results of this study, 66% of French appreciate new technologies, but 11% are completely crazy. Nice score, right? Yes, but not everything is rosy and some of our fellow citizens (22%) could not care less of everything that relates to this topic. Worst 1% of the population even vouerait fierce hatred of all that is approaching near and far to a computer, a smartphone or even a tablet. anti-geek (11%). He hates both new technologies and Geeks. If he could, he would even cut the power of our internet cable box. This obviously does not prevent it from having the basic equipment. Some of you may be in which category they are asking. If this is your case, then you can go on imagined by Crucial, a test that is available at this address test. You simply answer a few questions to know the fraternity to which you belong. To end on a note a little more serious, and because it is very good news, well aware that High-Tech products are no longer the preserve of the upper classes. In reality, they are considerably democratised in France over the years. Finally, note that this study is based on the testimony of 1,002 user aged 18 and over. This panel has been carefully selected to reflect as closely as possible the French population.